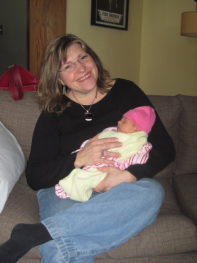 My interest in becoming a doula began in 2000 with the doula assisted birth of my first daughter. The support, confidence and birthing "know-how" provided by my doula inspired me to help others during childbirth. I've been a DONA certified doula since 2001 and have attended a wide variety of births (natural, medicated, induced, twins, VBAC, cesareans, and adoption) with all kinds of people (single, married, teen, queer and mature). I'm a trained HypnoDoula able to support those choosing HypnoBirthing for their birth as well as those who've prepared through other forms of childbirth education. Besides serving private clients, I work with the Ilythia Project helping HIV positive people give birth, and am an active member of the SPIRAL Collective providing full-spectrum doula support. I also speak Spanish and love to use it at births when there is an opportunity. With good physical and emotional support and a solid base of information to draw upon, childbirth can be a transforming experience. Since every pregnancy, labor and birth is unique, I adjust to your changing needs. We meet at least twice before the due date to work on birth planning and baby positioning. Once labor begins I provide continuous support until your baby arrives. I meet with you two times after baby is born and can help with establishing breastfeeding as well as recounting your birth-story. Every birth deserves skilled labor support. I would be honored to be part of your birthing team.